I certify that my business makes or designs our products. We are not sales representatives of any kind. 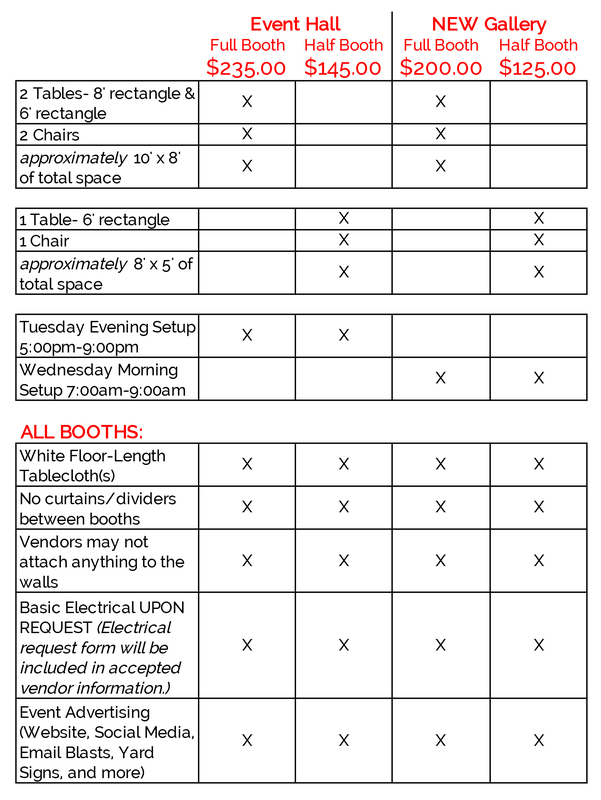 Consult the chart below to determine which booth is best for you. are coming from out of town and don’t want to spend the night in Greensboro. have a product that is quick and easy to set up. only need a table for your display (table, chair, and tablecloth are included with your rental). If accepted as a vendor, I commit to provide my raffle item (not a gift certificate) upon arrival for event setup. I accept and understand that the coordinators of Merry Merry Market will decide if a vendor application is accepted or denied. I accept and understand that priority review will be given to applications in the order in which they are received. Once the jury decides that a category is sufficiently represented, no additional vendors will be accepted. I accept and understand that I cannot be a vendor if I (or a representative) am unable to be present for the entire duration of the event, 9am-8pm, and breakdown/cleanup immediately after closing. Failure to comply with this provision may prevent me from being accepted as a vendor at future events. I accept and understand that event setup in the EVENT HALL is the night before shopping opens (5:00pm-9:00pm) and the morning of the event (7:00am-9:00am) in the GALLERY. I accept and understand that, if accepted, my booth space will not be officially reserved until Merry Merry Market receives my NON-REFUNDABLE payment in full. I accept and understand that as a vendor I am responsible for collecting my own sales tax, as well as all cash, check, and credit agreements with customers. Merry Merry Market will not be liable to any customer for a sales agreement with me. I accept and understand that I am responsible for my booth area, my belongings, and any materials or products I bring to the event. Merry Merry Market will provide a Security Guard for the duration of the shopping day and doors will be securely locked overnight after setup in the Event Hall is complete, but it is understood that the event sponsors are not liable for any damages, loss, theft, injury, or disappearance of any property belonging to vendors. I accept and understand that I am liable for any fees incurred due to damages caused by myself, my agents, or my property, or failure to leave the space as I found it. I accept and understand that I cannot attach anything to the venue walls, columns, windows, or floors (even with non-permanent adhesives). I accept and understand that Merry Merry Market does not have or provide insurance against the loss of or damage to vendor property at the event for any reason. I assume sole responsibility for insurance of any kind that I may require, including but not limited to, insurance against property damage, personal injury, theft, and vandalism. I agree to indemnify and hold harmless Merry Merry Market from all loss, claims, and expenses arising out of any liability for injury or damage to persons or property during the course of the setup, event, and breakdown. I accept and understand that should Merry Merry Market be cancelled prior to the event date, all vendor fees will be immediately refunded in full. Such refund shall be accepted as full settlement and no further damages or payments will be pursued or paid. I accept and understand that failure to comply with all of the above statements could prevent my acceptance into future Merry Merry Market events.